The Northeast's Only Classic Carnival + Rock' Roll Festival Experience is BACK! As recently announced, the annual ROCK CARNIVAL is back for its second year - taking place on September 30, October 1 and October 2 at its new location in Lakewood, NJ at FirstEnergy Park, home of the Lakewood Blue Claws. As with its inaugural year, which drew a staggering 50,000+ attendees, the second annual ROCK CARNIVAL will feature classic amusement rides and entertainment, the most delicious food truck offerings, high-action Professional Wrestling, a wide selection of tasty brews, and of course... the best in local, national and international rock music performances! This year's event will also see the addition of more carnival area space and a children's fun zone. 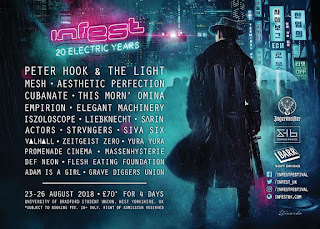 This is a weekend of big fun for the whole family! ROCK CARNIVAL is pleased to announce even more stellar talent performing at this year's show. In addition to Saturday headliners and heavy metal legends Twisted Sister performing their can't-miss official tri-state farewell show, fans will enjoy a legendary Friday headline performance from none other than the original shock rocker himself, Alice Cooper. Pop culture icon Alice Cooper pioneered a grandly theatrical brand of hard rock that was designed to shock. Drawing equally from horror movies, vaudeville, and garage rock, the group created a stage show that featured electric chairs, guillotines, fake blood and boa constrictors. With a schedule that includes six months each year on the road, Alice Cooper brings his own brand of rock psycho-drama to fans both old and new, enjoying it as much as the audience does. Known as the architect of shock-rock, Cooper (in both the original Alice Cooper band and as a solo artist) has rattled the cages and undermined the authority of generations of guardians of the status quo, continuing to surprise fans and exude danger at every turn, like a great horror movie, even in an era where CNN can present real life shocking images. With his influence on rock & roll long since acknowledged, there is little that Alice Cooper hasn't achieved in his remarkable career, including platinum albums, sold-out tours and any number of honors and career achievement awards. As he heads back out on the concert trail each year, Cooper insists he's still motivated to continue touring and recording albums, as well as making time for such side projects as Cooper'stown (his Phoenix-based restaurant/sports bar) and his "Nights With Alice Cooper" nightly radio show, syndicated domestically and worldwide on over 100 stations. 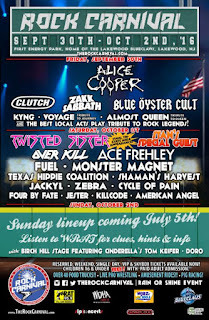 In addition to Alice Cooper, other newly announced artists include Clutch, Blue Oyster Cult, Zakk Sabbath, Cycle of Pain, Zebra, Jackyl, Shaman's Harvest and KYNG. 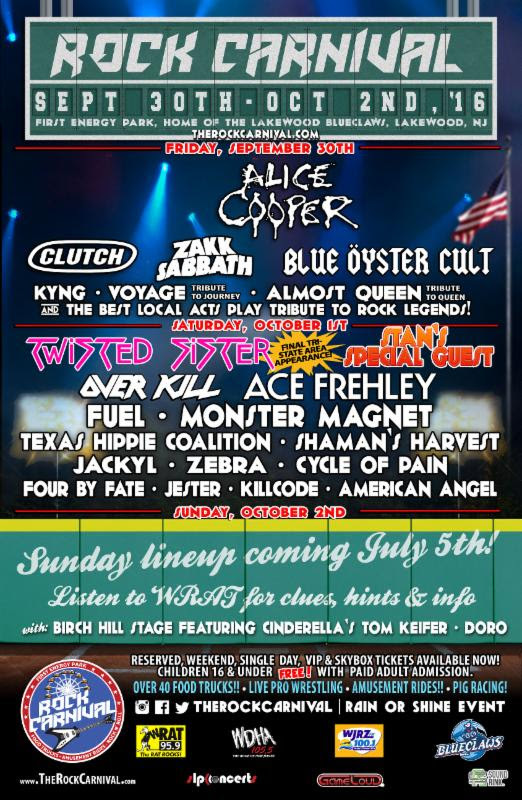 These artists join previously announced ROCK CARNIVAL 2016 artists Overkill, Ace Frehley, Monster Magnet, Fuel, Cinderella's Tom Keifer, Dokken, Texas Hippie Coalition, Doro, Four By Fate, Killcode, Jester and American Angel. Even more ROCK CARNIVAL performances will be announced soon, with Sunday's performance line-up being announced via 95.9 the WRAT on Tuesday, July 5! Music will take place on multiple stages including two main festival stages, side by side, on the field. Fans will have general admission access to the stadium field. The musical portion of the event will once again feature the Birch Hill stage, a very popular performance area, with the addition of another performance area showcasing developing artists. This year's festivities will also include a brand new "Classic" Friday night celebration, which will feature tributes to classic rock favorites! Voyage will perform a tribute to Journey, Almost Queen will play your Queen favorites, and Zakk Sabbath - featuring vocalist/guitarist Zakk Wylde (Black Label Society, Ozzy Osbourne), bassist Blasko (Ozzy Osbourne, ex-Rob Zombie) and drummer Joey Castillo (ex-Queens Of The Stone Age) - will perform Black Sabbath classics. Reserved weekend, GA weekend, single day, VIP and Skybox tickets for this year's ROCK CARNIVAL are on sale now. Carnival entry is FREE for all children under 16 and Adult Carnival Only Admission is $15 in advance, $20 at the Carnival. Carnival Only Admission does not include stadium access. Single Day, VIP Packages and Skybox Meet & Greet's, powered by SoundRink, are on sale beginning today. Find VIP packages and Skybox tickets via SoundRink. More carnival details, per-day line-ups and other entertainment will be announced soon. For more information, visit therockcarnival.com. The ROCK CARNIVAL is produced by Stan Levinstone Presents and GameLoud.